Raise money for the American Diabetes Association while participating in a fun & healthy event. Please click here to download the fundraising form to solicit donations from your friends, family, colleagues, and vendors. All money should be turned into the ADA registration area. 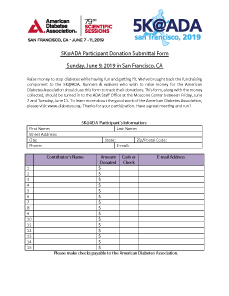 For each $500 you raise, ADA will give you a $25 gift certificate good in the ADA Store on-site in San Francisco. There will be an additional prize for the top fund-raiser! The American Diabetes Association funds research to prevent, cure and manage diabetes; delivers services to hundreds of communities; provides objective and credible information; and gives voice to those denied their rights because of diabetes. Founded in 1940, our mission is to prevent and cure diabetes and to improve the lives of all people affected by diabetes. For more information, please call the American Diabetes Association at 1-800-DIABETES (1-800-342-2383) or visit www.diabetes.org.